Just kidding. 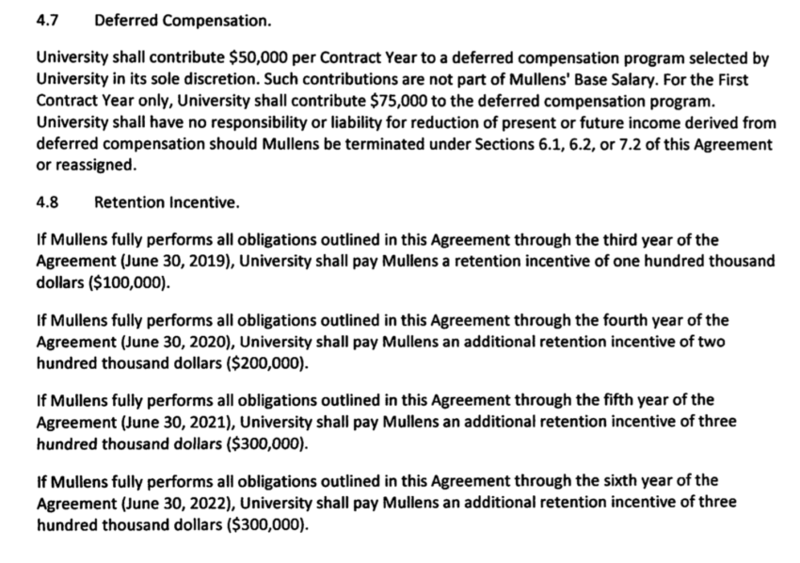 As explained below, the UO administration has rewarded Rob Mullen’s consistent failure to produce any profits for UO with a big raise and a porkalicious contract which they kept secret for 8 months, after using a loophole to avoid public review by the Board of Trustees. Most of Nike’s executive team got double-digit pay cuts in 2017, a reflection of a difficult year at the company. Mark Parker, Nike’s chief executive officer, president and board chair, took the biggest hit. While he’s not headed for the poor house anytime soon, Parker’s total compensation fell from $47 million in 2016 to $13.8 million this year, a 71 percent reduction. Sure. 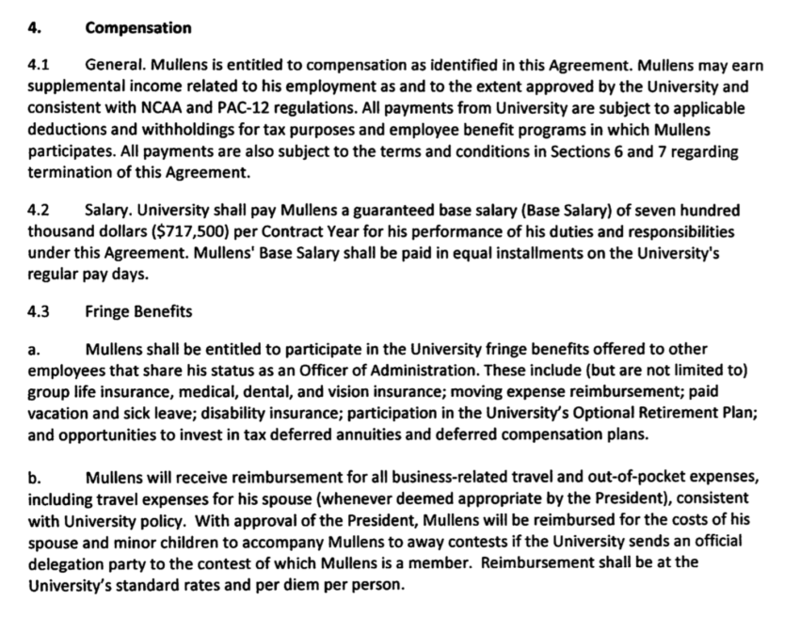 The most disturbing parts of this contract are the perverse incentives it gives Mullens to inflate spending and increase the amount of money he gets from ASUO and from UO’s academic side – many millions a year in subsidies – and the lack of any consequences for Mullens for additional damage to our “brand” from new scandals on his watch. 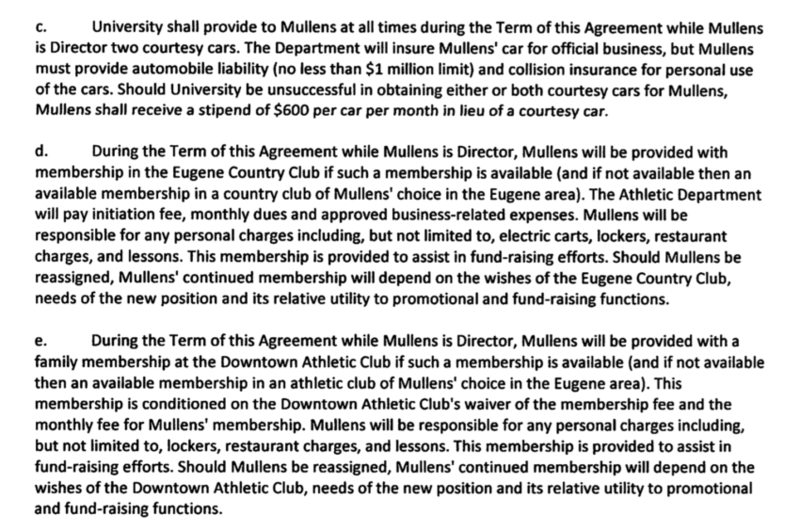 Instead of a bonus for the “Director’s Cup” Pres Schill should have paid Mullens a percentage of any money the athletic department transfers to the academic side to support UO’s academic mission. But Schill is going to just assume “that he will continue to work for the benefit of the entire university.” That’s unlikely. 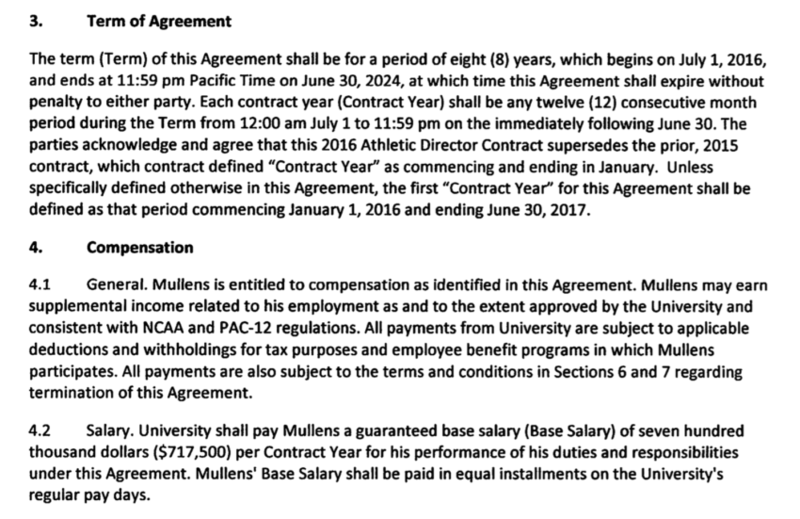 I predict Mullens will continue to do what he’s been incentivized to do – win games for the Ducks, regardless of what it takes and how much it costs the university in money and reputation. 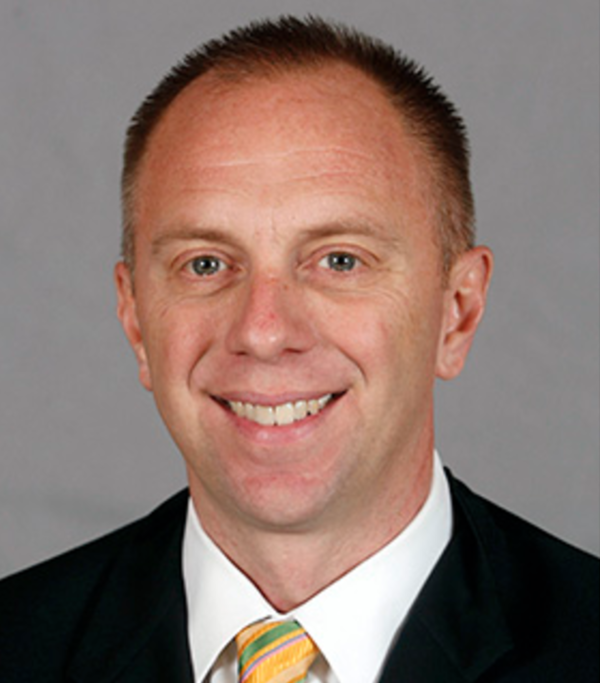 Apparently the raise that the Trustees approved in 2015 was not enough for AD Rob Mullens. He came back for more, and President Schill gave it to him, in October. $10M over 8 years, with retention bonuses and penalties for UO if we fire him, unless for cause. Apparently incessant scandals and millions in subsidies are not cause. Tagged Rob Mullens. Bookmark the permalink. Approve the snake Rob Mullens’ raise but fire faculty members due to budget cuts. Seems legit. It costs a lot of money for someone who knows how to play ball. Extra payments of $25,000 and $50,000? You could hire a couple of classified staff or a REAL professor for that kind of money. Shame on UO. Legacy in the classroom hardy haw haw haw! Still — long as uncle is paying — the incentive for UO is make uncle happy in hopes he will eventually unload a bil or two on the “regular” campus. Mr. Mullens is paid more than CEO’s of publicly traded companies, when comparing base salaries and total salaries. Please note I’m not referring to small publicly traded companies, I’m referring to companies that generate hundreds of millions of dollars in revenue. And many of those CEOs don’t just bring in revenue, they actually control costs and make money for the company, and they avoid repeatedly damaging the reputation of the stakeholders. Isn’t this consistent with academia versus corporate jobs, though? We accept lower salaries in exchange for lower variance? Would this, alone, fund reasonable COLA’s for classified staff, keeping step increases, not increasing insurance percentage? Yeah, probably. But there are more contracts like this one. They all drive tuition up. Especially with golden parachutes like above. 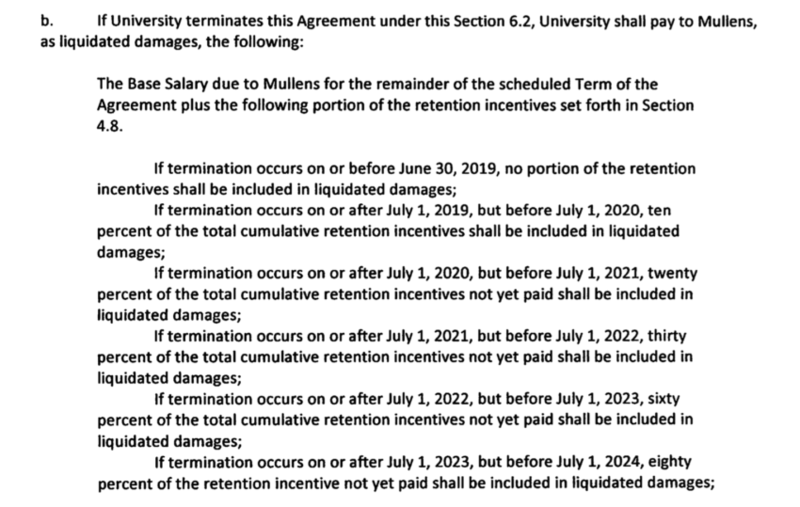 Note the progressive nature of retention incentives and retention incentives not yet paid in case of early contract termination. It is the cumulative perks that are frivolous. Thanks for reporting on the outrageous duck pork. Keep up the good work. The board should be all over Rob’s robbery, but they’re AWOL. If only the overfed Ducks could be made into some academic fois gras. Good job Pres run this place into the ground one expensive Administrator at a time.